Story: A quietly observant young man gets an office job in the city, where he takes his first tentative steps into the adult world, and falls in love with a pretty co-applicant. I once read a cartoon featuring an old man lying in bed, covers pulled up to his nostrils. Next to him, an obnoxiously cheerful wife hovered, chirping, “Wake up, honey! Today’s the first day of the rest of your life!” The next panel switched to a courtroom, with the sleeping man standing in the docket and a judge slamming down his gavel. A speech balloon conveyed the verdict - “Justifiable homicide, case dismissed.” A curious anecdote with which to introduce Il Posto, because the cartoon’s arch cynicism could hardly be more out of tune with Ermanno Olmi’s warm, open humanism. Yet it serves to set the film in stark relief, because Il Posto also opens with a character in bed, his eyes wide open, a mother rather than a wife calling out to him. There are times in one’s life where clichés shake off the accoutrements of familiarity and take on a fresh, glowing meaning - “oh, that’s what they meant,” we think to ourselves. If someone told Domenico Cantoni, “Today is the first day of the rest of your life,” he would know exactly what they meant, and it would not be cause for a bitter, murderous outburst but rather excitement, anticipation, worry, and a bit of fear. In his late teens, Domenico hovers between the comfortable world of his childhood and the unknown world of adulthood. He heads off to Milan, where he will apply for a job at a corporation, but back at the provincial suburban apartment block where he lives, his parents still complain about him going out at night, and scold him when he tries to boss around his baby brother (the only time we see him as anything other than shy and deferential). Of course in the city, where his adult life is supposed to begin, he’s never seemed more the lost little boy: quietly watching the grown-ups around him, wondering anxiously when he’ll be fully initiated into their strange world, and perhaps silently fearing that once he is, the freshness he takes for granted will dissipate and disappear. For the moment, excitement reigns, and simple scenes carry a double meaning. They represent a real, specific situation, yet convey an extra resonance given the circumstances. Each step forward opens a new world, each turning of the corner breaks a bond with the past, and the buildings glimpsed out the window of a speeding trolley may as well be monuments to the new horizon, unexplored, pregnant with promise and perhaps vaguely threatening as well. 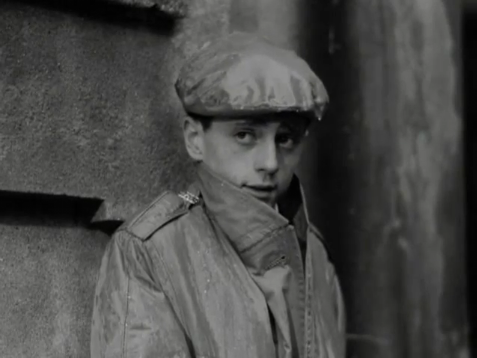 Il Posto is a film of youth; not a film of restless, ruthless rebellion nor exuberant romanticism (Fists in the Pocket and Before the Revolution would arrive on the scene soon enough) but a film of youth nonetheless. It belongs to the Italy of the early 60s rather than the mid 60s, when the tendrils of neorealism still clung to the visions of Fellini and Antonioni, when postwar Italy was still warming to the fact of its economic recovery and development, when filmmakers were moving past the portraits of desperation and a yearning for security, into the realm of dissatisfaction and alienation - indeed, Il Posto hovers uneasily between those two sensibilities, mostly conversant with the first but hinting at the approach of the second. It is a film of youth not just because Domenico Cantoni (played with a wonderful wide-eyed, unpresuming soulfulness by Sandro Panseri) is young, but because he embodies youth. Of course, no body, no thing in this film "embodies" meaning in the usual sense; each individual is him or herself first and always. In focusing so acutely on the particular, writer/director Olmi (with co-writer Ettore Lombardo) manages to illuminate the universal. These illuminations appear suddenly and unexpectedly, lightning insights into the offscreen lives of characters who might otherwise be reduced to types or extras. But this is not the lightning of a fierce thunderstorm, screaming across the sky and temporarily blinding us with its bright glare. Rather, think of an electrical storm where little hairlines flicker silently in dark corners of the sky, allowing us to peek briefly into the night, while ominous yet safely distant booms sound somewhere out there, reminding us how far the world stretches beyond our familiar horizons. As we follow Domenico on his journey, from that early-morning bed to the clerical desk where he ends the film, we frequently pause for asides, digressions, even one full-blown divergence from his point of view. It is sometimes hard to tell when this curious observational quality of the film is Domenico’s and when it belongs to the director. Sometimes, as when an old man wanders into the corporate headquarters and asks, “Where’s the welfare office? Where do they take care of poor people?” (the receptionist shrugs comically), Domenico is standing nearby - in this case waiting for an elevator, well within earshot. On other occasions, the situation is more ambiguous; when the overbearing mother of one of the applicants (she holds his hand all the way into the room, and responds to his name during a roll call) pauses in front of an old mirror to examine herself, Domenico is in the other room; we are alone when we chuckle at her harmless vanity, and then we never see her again. And Domenico is at the far end of the hallway when two secretaries whisper about him behind his back - “How’s the new messenger?” “Cute - and so young!” Could he really have overheard them? Could he, perhaps, even have imagined this exchange? These questions arise most prominently in the film’s most adventurous break - when we follow several of the older clerks through their nightly rituals and private lives. One old worker, hunched over his desk at work, is at home an aspiring novelist, stuffing away pages of his unfinished masterpiece while his landlady lingers in the hallway, griping about missed bills. Another employee, nearing sixty, spends his evening serenading friends and familiar customers at a bar, seemingly content with his life as an afterhours Caruso. A female clerk pretends not to see her young son lifting notes from her wallet, then brings her grief to work, weeping silently while co-workers gossip about her (repeating a banal observation in unison, they divert themselves with a game of jinx). In his wonderfully astute essay on Il Posto, Kent Jones observes that this passage “feels like an illumination of Domenico’s own perceptions: these hushed vignettes represent the lay of the adult land, as well as a set of possible futures.” So true, yet they must have their own reality as well; after all, when the old would-be novelist dies, his desk is cleaned out and the other employees discover a jumble of pages labeled “Chapter 19” among his effects. Shrugging, they discard them into the “personal” pile and then Domenico, who has been waiting for an opening, moves in. Seniority, however, quickly shifts him to the back of the room where his attention becomes fixed on the neverending mimeograph machine, the first flickerings of dread beginning to shape themselves in his consciousness. An unseen period must intervene, with anxious worrying about work mixing with a desire to renew his crush. And then he’s hired, he returns to the big building in the city, and they meet once again. Antonietta nonchalantly avoids and then peremptorily and casually returns his glances at the follow-up interview, but later they will wait together for her bus. “Did you wait for me?” her eyes sparkle, and it’s she who invites him to walk her to her stop; he lingers but makes no move and she smiles at him, wisely and wistfully, after making fun of his name - “Domenico suits you. Because you’re old-fashioned too.” Even such a broken tune is music to Domenico’s ears and it keeps playing all the way home - at least until he realizes, in a daze, that he boarded the wrong car and the train has left him behind, all alone on the frozen railroad. Attempts to meet up with Antonietta during lunch hours fail; they’re on different shifts; it rains and two older men hover near her, holding an umbrella aloft. Again, Domenico is in the station, left behind. Yet he runs into her when delivering a message to her building, and she invites him to the social club’s dance, where she’ll celebrate New Year’s Eve - “if my mother will let me.” Perhaps her mother doesn’t let her, perhaps she’s flaky, perhaps it just wasn’t meant to be, but Antonietta never shows up at the dance. Domenico has a good time anyway, dancing and getting drunk with people twice his age, even as he watches all the couples who take their romantic luckiness for granted embrace and kiss at the midnight hour. Then he’s back to work the next day, at his new desk, cue the mimeograph. Probably he and Antonietta will not see much more of each other; maybe a smile, a hello, from time to time, ships passing in the night and all that - eventually even the greetings will cease, the foghorns fall silent, and the ships will go their separate ways. Yet hope remains. When he made Il Posto, Olmi had been working in just such an office for a dozen years; having made his way on industrial films and documentaries for the company, Il Posto represented his break into narrative features (it was his second such project, but first big success). Since then he has become a world-renowned director, crafting I Fidanzetti and Tree of the Wooden Clogs, among other acclaimed movies. But that's not all. Shortly after shooting wrapped, Olmi also got married. His bride? 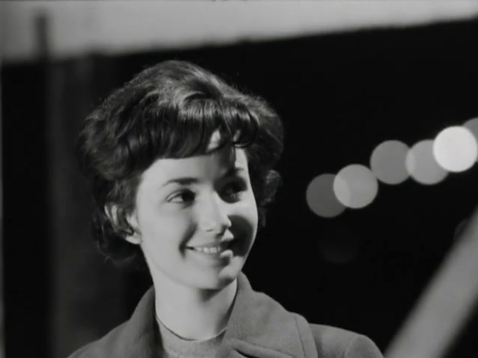 Loredanno Detto, the delightful and charming one-time-only film actress who, of course, plays Antonietta in Il Posto. Olmi has suffered chronic illnesses over the years (which often arrested his filmmaking endeavors) but in his films and very rare interviews, he continues to express a cautious openness to life. If the glow of this movie is any indication, when Loretta wakes Ermanno up in the morning, should she reiterate that opening cliché, he would greet her not with rage or despair, but with a smile - shy perhaps, certainly a little bit sad, yet a smile nonetheless. Read "Handcrafted Cinema" by Kent Jones; watch Shooting Down Pictures - Il Posto by Lee & Uhlich.